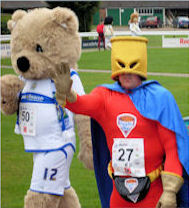 Pork pie man Stuart Booth finished In the top 10 of a mascot race. The Outlane man came sixth out of 95 at Wetherby Race Course. Stuart ran a furlong 250 metres in full costume, including his pork pie hat. The race, at the Yorkshire Federation of Young Farmers Clubs’ event, was won by Mr Noodles. 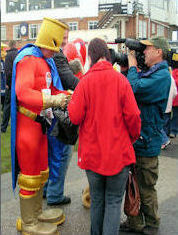 Mascots from Leeds Rhinos and Blackburn Rovers were among those taking part. Stuart, 49, had been on a strict training regime prior to the race. “I’ve been eating lots of pies,” he joked. He raised £100 for the care charity Sue. Ryder Care at the event and also handed out pork pies from Hinchliffe’s Farm Shop in Netherton. Stuart is the official mascot of the Pork Pie Appreciation Society. 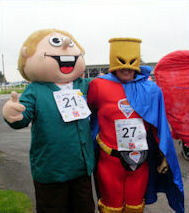 Albie, official mascot of The Piazza Centre, also took part in the race. All the sprint training paid dividends as Albie shot into the lead only to be cruelly tripped by the second fence. Gamely he recovered his composure to pick himself up and race on to a very creditable 20th place (out of 93 runners). Albie hopes to have raised around £450 for Sue Ryder Cancer Care.